Both of Hindu and Buddhist tantra teachings agree that our breaths affect our temperament. Having said so, the approach of Hindu tantra and Buddhist tantra is quite different; hence the results too are different. · If air flows through left nostril, then a person feels at ease, friendly, happy and tends to be confident and tends to perform other benevolent acts. · If air flows through right nostril, then a person is on a more active and on a more muscular side: he/she would do exercises, martial arts, and music or even go to war. · If air flows through both of the nostrils, then spiritual energy would grow and hence the person feels ‘emptiness’. In Hindu swara yoga, the flow of air into our nostril is in accordance with astrological timings. If the flow of air is against the correct astrology, then one should change the flow of air to avoid mishaps from happening. Other than that if there is a desire to change one’s activities then the air flow should also be changed in tune to the correct activity. Also if one thinks he/she is falling sick or if one nostril operates for more than 2 hours in a particular day. As we can conclude that swara yoga teaches us to tune into our daily activities and make use of breathing technique to avoid disasters; at this point we can say that swara yoga teaches us to live in this mundane world in harmony. No wonder those who follow this teaching of old are progressing and become prosperous. That explains why India is emerging as a emerging economic power house. On the other hand, Tantric Buddhism advocates the idea of ‘shunyata’ (emptiness) and follows the third option in the hope to prove theory of emptiness is correct. The problem is that as one’s spiritual energy grows, he/she become quieter and calmer. Consequently this person is not interested in doing worldly activities. Needless to say, this is not good for business. If there are too many people engaging in spiritual practices in a country, then this country will definitely fall behind in this competitive world. Perhaps the Buddha has seen this problem and hence gave out a prediction that Buddhism shall vanish in this world in the end of dharma era? I supposed there are some truths in this as the matter of fact that at the nations where people only engaging in religious ceremonies cannot progress at a quicker step. This is simply religious activities consume money, if there are no people working; who else will generate money for the monks then? If there is no people giving birth, then there shall not be any monks either J! Fire puja costume for general peaceful ceremony. Fire puja costume for wrathful ceremony is mainly made of bones. Previously this type of bone costumes were made of human bones, but now days this type of costumes are mainly made of yak or cow bones. A complete set of good bone costumes are very hard to come by and it fetch sky prices. This photo shows an old set about 40~50 years old originated from Tibet. Tibetan rituals are very intimidating and mysterious. Not only the tantric doctrines are difficult to understand and accepted by general public; the ritual implements are also works of arts and they are harder to find now days especially concerning human bone implements. 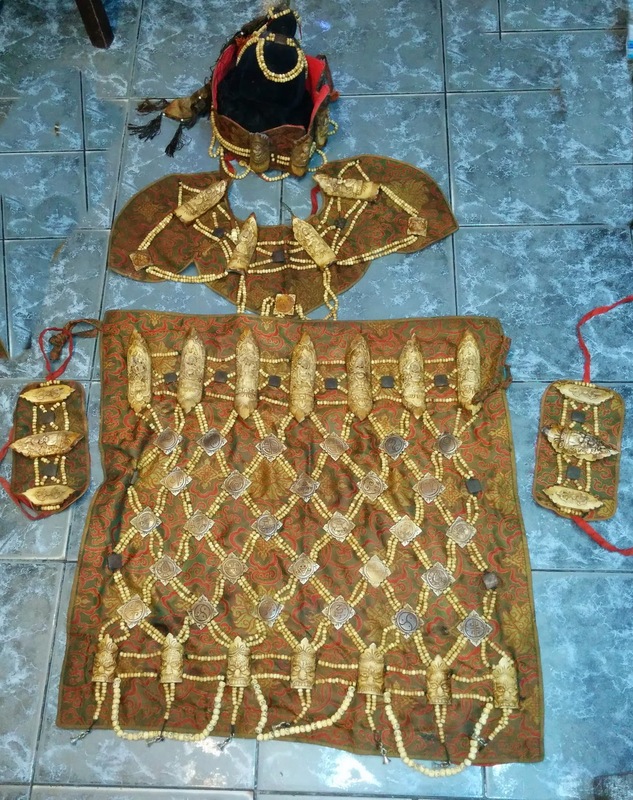 Due to my study of Tibetan rituals, I keep a set of each of fire puja costumes. Malaysia is too hot to wear these costumes but I am sure you can feel the power and vibrations by simply appreciating these work of arts. Mind you, both of the costume sets are pretty heavy too! Peaceful fire puja rituals are done mainly on special occasions: festive seasons, one's birthday, for deliverance services etc. A puja session must be initiated by a second party or the effect is not good. A wrathful fire puja is meant for obstacle removal or for subduing demonic forces, on occasion when a deceased is failed to be delivered during the first 7 days after his/her death, then a overpowering fire puja may be performed at the end of the second 7 day cycle. This is to save the person's soul from being reincarnated into lower realms. Of course, now days not many masters would wear these types of costumes outside of Himalayans ranges. Perhaps there are, but on very rare occasions in Tropics I am sure. Tibetan grandmasters such as Milerapa and Padmasambhava first obtained their transmission directly from India; and later they preached the teachings in Tibet. However due to over secrecy, many yoga techniques are lost in time. Hence, current Buddhist Tantra teachings are not quite the same as the Indian counterparts though the names remain the same. In Buddhist Kriya Yoga, the three terms: body, speech and mind are interpreted as mudra, mantra and visualization; practitioners also attribute this to the ‘three secrets’ (三密). It is said that one can only achieve siddhi when all of the three aspects are in union. Though some of the Higher Buddhist Tantra practices continue to refer the ‘three secrets’ in their teachings; I have some doubts as I am more inclined to think the Buddhist concept of body, speech and mind is in fact described by Swami Muktibodhadana in Swara Yoga. My special interest is with the term ‘speech’ (语). Many people think the ‘speech’ refers to ‘mantra’ but according to Swara Yoga, the speech refers to ‘swara’ or ‘voice of breathing’. So as you can see, the definitions given by Swara Yoga fit better in the context of Buddhist Anuttara Yoga Tantra. It is apparent that we now need to turn to the study of Hindu Tantric texts to understand the Buddhist Tantra teachings now days. Or further supplications to gurus would not yield any benefits if we cannot understand the meaning of true ‘speech’! Traditionally a Kong Tau or Thai Arjan worships many deities and spirits. The main character is of course the 8 major land 108 minor hermits (lersi), followed by Phi (ghosts) as in Phi Phop and other natural spirits. Let us set aside other spirits such as goddess of fortune, snake goddess, earth goddess, Kumanthong, Phra Ngan and many more other major and minor deities specific to each school. 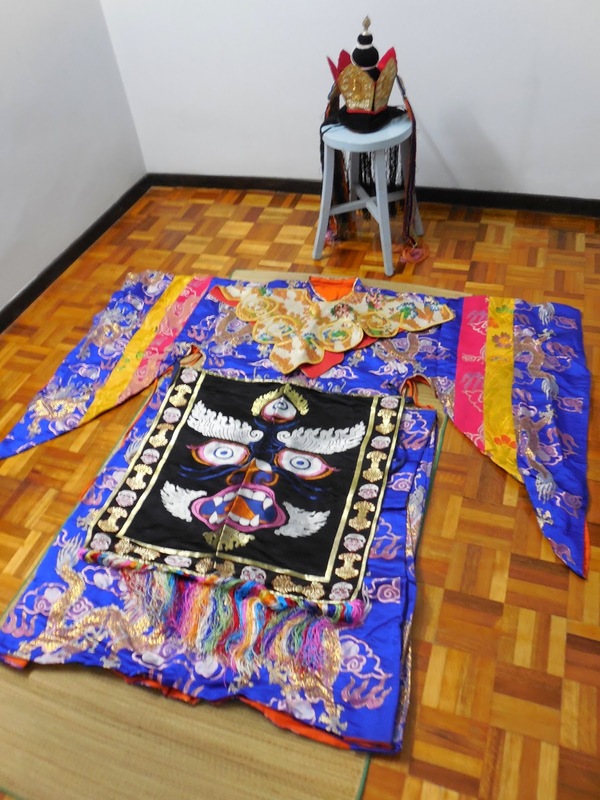 I even see some arjans worships Guan Yin and Taoist deities in his altar now days. Such act was not permitted just a few years back though. Having said so, now days many arjans behave as if they are also spirit mediums and these mediums may or may not understand how to cast spells. It doesn’t matter to the general folks as they shall not be able to differentiate anyway; so what is the difference right? It is not a surprise to say that although many Kong Tau (Thai Magic) masters admit that they are Buddhist, as a matter of fact, they practices are about 80% influenced by Hinduism and local animism; the Buddha is really the odd man out. Of course Buddhaguna, Buddha Jaya Mangala Khata and other auspicious prayers are being recited in the morning and at night. · Hanuman is claimed to be the grandmaster of Kong Tau. As in Indian Shabar mantra, he is worshipped for his power in bestowing protection against black magic. · Brahman is the god of creation. Legend has it that Brahman has 4 faces, 8 eyes, ears and arms. So he shall grant anyone who has prayed to Brahman wholeheartedly. It is said the best time for worshipping Brahman is between 7pm to 9pm. · It is said that goddess Kali controls over all lustful and materialistic sentient beings in this universe. When goddess Kali has possessed an arjan, he/she too shall make the facial expression by sticking out his/her tongues with wide open eyes. · Goddess Kali is worshipped for bestowing protection, exorcising evil spirits and for bestowing blessings. Certain sorcerers also invoke Kali to curse his/her opponents. Hence Goddess Kali is very much feared off amongst Kong Tau community. Not may arjans can control the energy of Kali. · Legend has it that Ganesha is the son of Kali. Story has it that Shiva, who is the husband of Kali went out for a long trip and Kali felt bored. So she used her power to ‘create’ a kid to accompany her. One day, Kali went out and she asked the kid to watch over the house property. As soon as Kali went out, Shiva returned home and found a kid in his house; both of them thought their opponent is the intruder. A fight broke out due to misunderstanding. Having said so, the kid is no match to powerful Shiva and his head was smashed into pieces by Shiva. At this time, Kali returned home and she was saddened by what she saw. Shiva felt sorry seeing Kali was so sad, so he cut down the head of a recently died elephant to replace the smashed head of the kid. Amazingly, the kid survived and he has become today’s Ganesha. Because the kid was charged to watch over the property of his house, later people also call Ganesha as “the elephant head god of fortune”. This Ganesha story reminds me of the story of Yama and Yamantaka. I wonder which comes first, and which copies which. Whatever case it may be; it does not matter as stories of our world are copied from one culture to another anyway. · Mix some sea water with cow’s urine in a bowl and then sprinkle the water all over the house during Tuesday, Friday, full moon and new moon. · If your livestock or pets frequently fall ill or loss of appetite, then bath the animals with turmeric water. · If your business is bad and you suspect it is the working of black magic, then you can put lemon or lime into a clear glass filled with water and put the glass at a conspicuous place. The water must be changed every day and that the lemon must be replaced on every Saturday. · If things in your house lost or broken quite often, especially if your electrical appliances; or your light bulbs burst at a regular basis. To remedy this problem, put some color beads or stones in a white bowl and hide it at a quiet corner. · If your baby likes to cry out loud at night or if the baby feels agitated after someone visited your house; then hold a pinch of salt in your palm and move your palm around the baby’s head three times clockwise and anti-clockwise. After that the salt is dissolved into a glass of water and then solution is poured into flowing water. · If your children suffer from constant stomachache and you suspect that it might the working of black magic, then you must take small amount of sand in the street and mix it with mustard seed powder. Then apply the mixture onto your children’s stomach. After that, recollect the mixture and burn it in fire. It is believed that by doing so, the black magic workings shall be burnt off as well. · If you believe that you are besieged by misfortune, bad luck or jobless, then it is best to keep an aquarium in the south side of your living room. · If a pregnant lady wants to ward off evil spirits or black magic, then she should bring along 2~3 pieces of need tree leaves when she leaves the house. After she returns home, she must burn the neem leaves. · If you are a speaker or a teacher who depends on speaking to earn a living and that you suffer from constant throat problems, then this might be someone who has cast a black magic on you. To remedy this, take a twig of Peepal tree (ficus religiosa) and tie it on top of your main door. After that take another twig, break it into 3 pieces and keep them in your pocket. · If you suspect that someone has put a separation spell between you and your wife, then keep some dry roast alum, red chili, green chili or a large sea shell and lemon near your bed. Then and again, modern Indian friends might not follow such practices. If you have more folk magic to add; then please kindly let me know. The reason for my unease of this particular year is that the ‘3 kills’ (三煞) of the year is at the north, while the 3 kills for the month is at the south. This making the movement from north to south or vice versa undesirable; in fact any major movements would not be desirable. This is because the 3 kills for the year belong to water element and the winter is when the 3 kills are the strongest. Further the ‘Tai Sui’ (太岁) is also located at the south too this year. During this particular year, the east coast is particularly vulnerable especially towards the end of the year. The year and month reading combines into ‘mountain and water’ making a 蹇, which means obstruction. This situation may last for one month or so but diseases may entail. Unfortunately, the lower characters are all in conflicts, this indicating of bad decisions that had lead to disasters. Hence, it is pretty clear that I Ching reads the mind of God. It is up to us the mortal being to interpret and take correct actions for the sake of our love ones. Let us pray together for all those who are suffering to have strength and for the rest to be free of all disasters in years to come. Keris used to be weapons of old days. Today, a keris has become a collector’s item. Well, there are people collect keris as antique; but many people collect keris due to their magical properties too. The price of keris ranges from USD100 to USD10,000 and above… this is especially true for ‘special’ types of keris. There are stories told if a keris is used to point at a person, old Malay believed that by this mere act, the person can be killed. Along the same line, some Malays believe of a form of magic called ‘ilmu tuju’ which coupled with appropriate incantations, pointing of a finger, keris or human bone to a person can bring bad luck or kill the person. A keris pusaka or heirloom keris can be used to stab onto the footprints of a person can also bring disaster or even death to a person. Some old keris are said to possess a watcher or khodam if someone like to call it. These types of keris are said to be thirst of blood and they will fly out from their sheaths during certain nights of the week, normally on Thursday or Friday night to kill people and after they are quenched with blood; they shall return quietly into the sheaths. It is believed that a keris in the collection of Taiping Museum has this capability. There is another heirloom keris in Kraton was said to be particularly bad tempered and it was ordered by the ruler to have it destroyed. Some people also believe that a keris pusaka can rattle in its sheath if its owner are facing with danger hence alerting its owner. Another type of keris known as keris majapahit has dual identity: a male and a female; it can also be used to transfer flames from a place to another place as well as performing the ilmu tuju. In Java, guts or brains of snakes are brought into contact with the keris in the hope to make the keris more deathly. The power of a keris pusaka is said to increase upon slaying of a person too. An execution keris that has been used to kill many people is considered as scared. Many people keep a keris in their house because they think the keris can trap a thief so that the thief cannot leave the place, the keris can also make firearms fail to work, in some instances even flood waters can be held back or even volcano flows. Some Javanese empu (blacksmith) even pointed out that his keris will fly out of their sheaths during the full moon when the Queen of the South Sea holds her court at seashore. Having said so, either it is lucky or unlucky that it is not easy to make or come by a magical keris. Believers believe it is only by the will of the God that one can own one of these treasures. In short, only a virtuous man/woman can get a piece by chance. If a keris does not fit a person, then everything in his/her life shall go wrong. Whatever case that might be, the cult of keris is still very much alive in Malay Archipelagos until today. There is a very good reason why one must and should learn from a qualified master before learning how to cast a death spell on others. Well, there is nothing wrong with cursing others; the problem is when the opponent is too powerful and the black curse is being reversed back to the spell caster. So, if you are cursing on others and when the curse is reversed; what can you do to help yourself? If you have been visiting the altar of Liu Ren (六壬) or Jin Ying (金英), then you shall notice a covered porcelain bowl filled with water and a piece of green leaf is dip in the water. The purpose of the water is used to absorb magical ambush if any onto the master of the altar. The only variation is that the ‘soul hiding’ rituals must be done as a precautionary ritual; i.e. the sorcerer’s soul is hid under a rock or tree even before any magic is cast. This hiding of soul should be performed on every 3 year interval. However, transferring methods can be done right after one has cast a curse onto his/her opponents. For example after I had cast a death curse onto Roy, then I will write this talisman: ＂勒令退法于某某物代挡＂onto an object, such as an umbrella. The only limitation is that one can only perform the transferring energy method for 72 times in his/her lifetime. For double precaution, many sorcerers would choose to perform both of the curse stripping methods. I have not seen the stripping of retaliations being practiced in other traditions except Taoist magic, maybe there are similar ones that I am not aware of. “The development in the center part at the beginning of the year but slows down at the end. Problems will arise in the east and the condition persists throughout the year and hence it is best to keep this place untouched. The north shall see some constructions but not free from incidents. The west shall see very little progress in developments. The developments in south shall also see little progress. The southeast and northeast shall see more development activities to come in the first half of the year. The southwestern activities may come still for the time being. So, from Palden Lhamo’s riddles, I think 2015 is only slightly better off compared to 2014; but overall the condition stays the same. 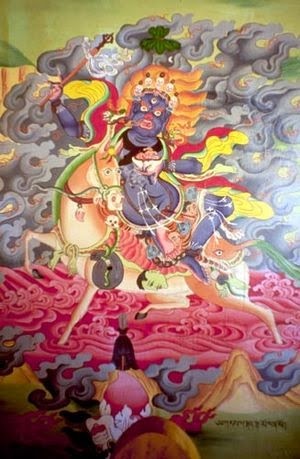 It actually was strange that Palden Lhamo came into my vision as this fierce deity is related to wars, disasters and epidemic. I think there will be some kind of epidemic in 2015; but let us just stay tune. If you have affinity to dragon, then the below dragon ‘creation’ spell is for you. First you should meditate and clear your mind. Then use your imagination to visualize the shape of dragon you want. When you have finally decided on a form in your mind’s eye, take the clay in your hands and work it into the shape of your dragon. Now, open your eyes and add details like ears, spikes, scales, and eyes. Then slowly fire your dragon in your kiln. When it is dried, then paint your dragon any way you want. After that, take the needle and prick your finger. Squeeze a drop of blood where his Heart would be. I'm not sure how long it takes for the life to go into it but when it does you will know. When you are in need, call its name then say "as I made you, you shall see. I need (to do something) so mote it be". You should make it a routine to call upon your dragon twice daily: once in the morning and once at night before you go to bed to check on the status of your dragon pet. It too needs your attention otherwise it may be low in energy and failed to perform to your expectation. 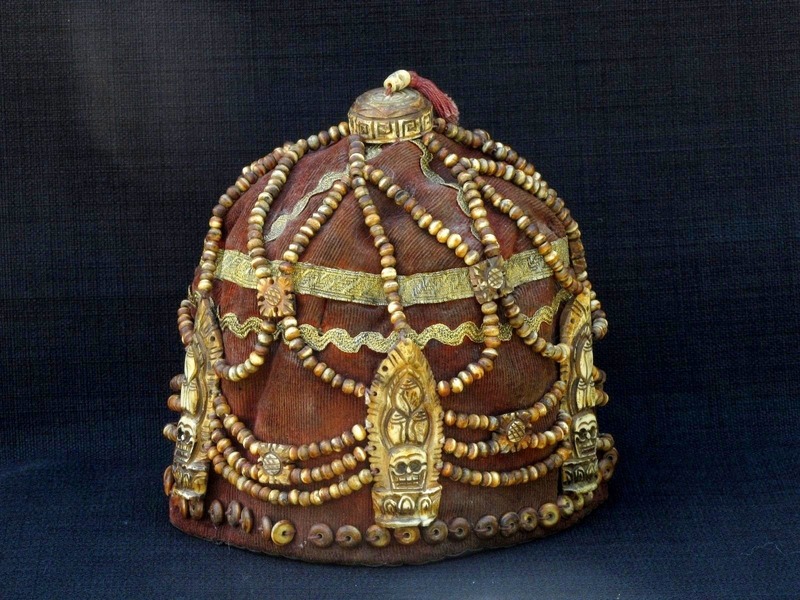 Tantric 5 skull crown belonged to Palden Lahmo medium. This hat used to be worn by a 90 year old medium in Nepal who was also a Ningma sorcerer. It somehow ended in my hands and the day before I received this beautiful hat, I dreamed of 13 Tibetan ladies in traditional costume holding khata (哈达) welcoming the arrival of the hat. Later I learnt that the leader of the ladies in my dream was the Snow Mountain Fairy with her 12 sisters. All of them were emanations of Tibetan mountain ranges. Coincidentally, the mountain goddesses are also said to be retinues of Palden Lhamo in Tibetan mythology. Palden Lhamo is equivalent of Sri Devi in Hinduism; although both of them do not look alike. My friend Mr. Wu was said to be possessed by a lady spirit after he went to pray for lucky numbers in front of a lady in red who committed suicide by hanging herself. Not only that Mr. Wu didn’t get the numbers that he wanted, the lady spirit wanted Mr. Wu to accompany her on the other side as she is very lonely as she cannot enter the underworld due to it was still not her time yet. All of the Taoist mediums refused to help as they said that the lady ghost was too fierce and that she is ordered to seek revenge. That was how Mr. Wu ended up at my place. To tell you the truth, I am not an exorcist and I do not intend to help people like Mr. Wu due to his bad karma. But since Mr. Wu was brought to me by a close friend, I have to help him. It was a coincidence that the skull crown was on my altar; I picked it up and put the hat onto Mr. Wu’s head and start chanting Palden Lhamo’s mantra: “Jiu~ lamo, jiu~lamo, jiu~jiu lamo…” repeatedly. After a few minutes or so, Mr. Wu started to shiver and fell onto the ground. So we propped him up and sprinkle some cold water onto his face to wake him up. After Mr. Wu regained consciousness, I asked him what had happened but he only gave me a blank look… apparently he thought that he was still at the cemetery! Since Mr. Wu has nothing wrong, I let him go home. Did the lady ghost returned to Mr. Wu, perhaps! But I didn’t follow up as I dislike tempering into other people’s bad karma. Rules Of The Road: Your Choice?